The South Park empire has spanned 15 years, with many a movie and game continuing the tale of the troublesome boys. The latest title by South Park Digital Studios takes the four foul-mouthed youths on a quest to retrieve Cartman’s Xbox 360 hard-drive from the hands of his ‘evil’ half-brother Scott Tenorman. 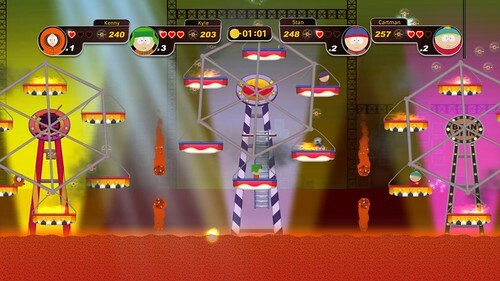 Not to be confused with the South Park RPG set for release later this year, South Park: Tenorman’s Revenge is a four player co-op platformer out now on Xbox Live Arcade. 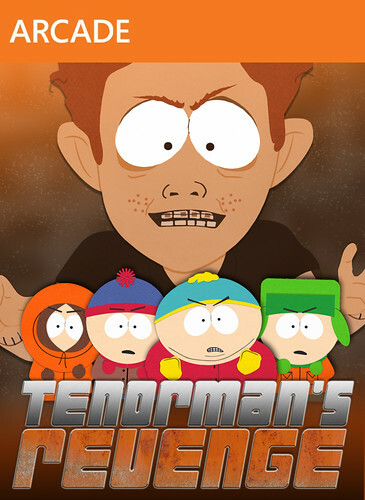 For those unfamiliar with the great villain of the game, Scott Tenorman is the ‘ginger kid’ whose first battle with Cartman ended with the unfortunate redhead eating chili made of his own parents. To make matters worse, it turns out he’s also Cartman’s half brother; yeah, the poor guy. 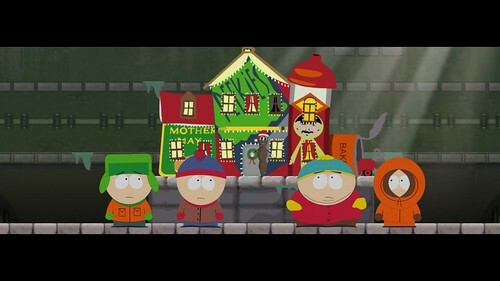 Somehow this leads to the story’s focuses upon Cartman as a great hero who, with the assistance of Stan, Kyle and Kenny, travels through time battling Tenorman’s army of robot gingers to get back their precious saved games. Because, you know, South Park logic. This game may not be for everyone, but if you’re a fan of the series’ offbeat humour or simply co-op action then you will likely enjoy this latest foray. As you begin this South Park tale, the first thing you’ll notice is that it all looks and sounds just right. The game has been fully voiced by Matt Stone & Trey Parker, the characters modeled perfectly and the jokes are exactly what you would expect. All in all the boys shuffle along and throw insults around as though it were just another episode. The levels themselves are a treasure trove of references, with jokes, environments and characters both old and new. Fans will find themselves smirking and nodding knowingly while wading through Pi Pi’s Splashtown, catching a ride on the ever-classy Poo Choo Express #2 and hanging out with the likes of Towelie. 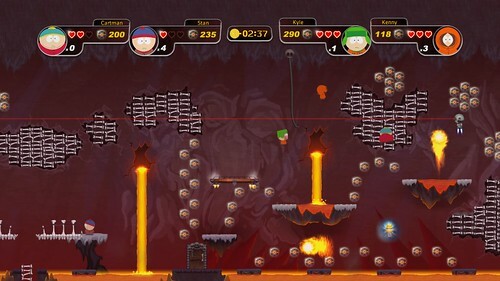 In Tenorman’s Revenge you play as one of the four main characters, each with their own special ability; Cartman breaks down walls with his weight, Stan throws footballs to hit switches, Kenny can jump super high and Kyle can disarm ginger forcefields by flashing his red-head fro. At certain points you can also turn into the boys’ superhero alter egos, each with unique powers. The purposes of all these is to gain you entry to the many secret (or simply inaccessible) areas of a level and the collectables hidden within; as each boy can only reach particular areas, you’ll eventually need to play as each character, or with them online, to find everything. This is interesting enough to begin with, but becomes a headache for any solo players as you reach the higher levels. 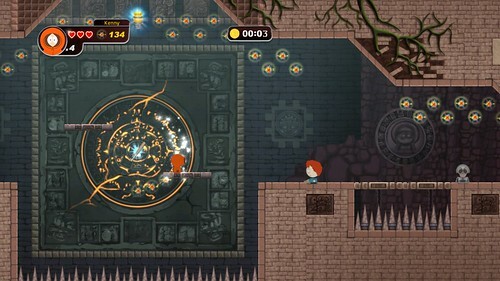 The problem is that one of the main collectables of Tenorman’s Revenge – The Time Particle – adds up to unlock the next level, and as the game progresses you need more and more to continue. This means that the lone wolves out there are forced to replay the same levels over and over again in order to move on, and unfortunately they’re just not as humourous the second, third, fourth time (or more). Rather than making the game feel dynamic or tactical, the unique powers/areas feel tedious. There are just too many inaccessible areas and no fun to replaying a level; rather than thinking “Ooo I wonder what’s in there” you simply find yourself sighing. So for better or worse, Tenorman’s Revenge has been made for co-op. If you have yourself a few friends with which you enjoy playing and swearing, the game can certainly be a lot of fun. Watching the four boys abuse one another, as you sit on the couch abusing your friends certainly makes the game easier, not to mention more enjoyable, as you search for each character’s hidden collectables, spy secret nooks and race to grab the health/power-ups (or point them out to your friends in need, if you’re nicer than I am). The down-side of a team is you’ll find the screen stretching to accommodate attempts at independence or impatience; go too far and you’ll be warped back to the pack, or get stuck offscreen with enemies you can’t see. It’s a little frustrating, but that’s just how it goes sometimes. Playing co-op online however is a whole other story, changing the game from a funny, chaotic rampage into a truly soul crushing experience. Considering the game’s frantic pace, the addition of lag can renders it completely unplayable; a minimum one second delay makes avoiding enemies and projectiles a nightmare, while timing jumps to moving platforms nigh impossible. Basically if you’re planning to play this game with friends, it is only worthwhile if you have them sitting in the room with you, or a really long ethernet cable. 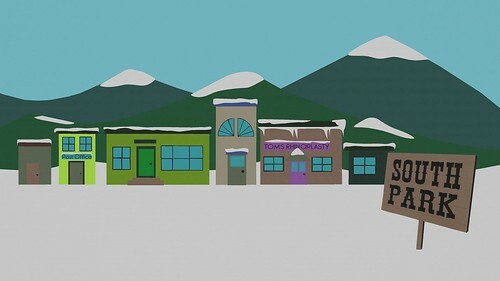 Overall South Park: Tenorman’s Revenge is a fun co-op game that certainly does justice to the iconic style and humour of the South Park universe. Co-op is what it’s all about and there’s enough gameplay to keep you and your mates entertained. Unfortunately the game is really let down by the experiences outside of a same-console gaming. Going solo will have you replaying levels ad nauseam and the lag online makes sections unplayable. 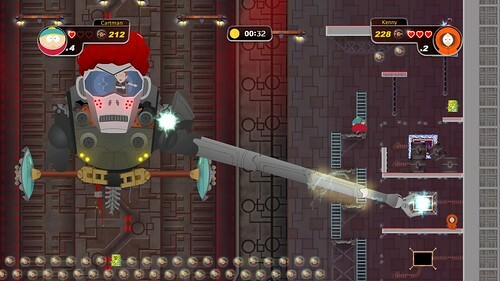 If you’re looking for a South Park experience its worth checking out their excellent foray into the Tower Defense genre, but Tenorman’s Revenge still has some fun to offer a group of four looking to hang out and abusing each other; it’s what friendship is all about. 6.0 – Above Average. Fun but it is let down by some questionable design choices. While it has its own identity, it doesn’t go beyond its own limits.